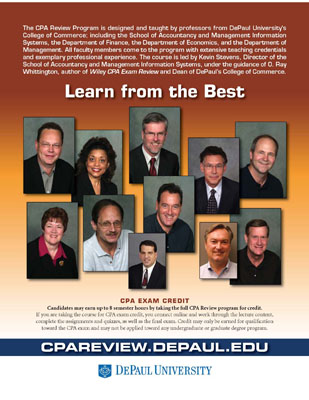 DePaul University’s nationally recognized CPA Review program, using Wiley CPA Review materials, has helped thousands of candidates become Certified Public Accountants for over 60 years. Building upon this firm foundation, DePaul will launch an online review in 2010. We realize that work, travel and family commitments prevent some from coming to regularly scheduled classes in Chicago. To address this need for an asynchronous online course, we now offer this option. The online course has the same learning outcomes as the in-class counterpart, but is taught week-by-week using a combination of video, text, downloadable content, quizzes and discussion. You will never need to be online at a specific time — you can progress through weekly content at your own pace. Your participation in this online course will equal, or exceed, that of a typical face-to-face class. The ideal candidate for the online review will know how to schedule their time accordingly to keep up with their studies. 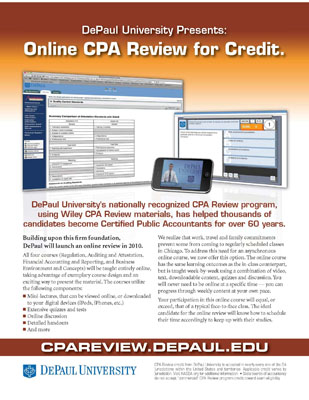 CPA Review credit from DePaul University is accepted in nearly every one of the 54 jurisdictions within the United States and territories. Applicable credit varies by jurisdiction. Visit NASBA.org for additional information. State boards of accountancy do not accept “commercial” CPA Review program credit toward exam eligibility. Topics include federal taxation, ethics, professional and legal responsibilities, and business law. Topics include generally accepted auditing procedures, generally accepted auditing standards and other standards related to attest engagements. Topics include generally accepted accounting principles for business enterprises, not-for-profit organizations, and governmental entities. Topics include general business environment and business concepts that candidates need to know in order to understand the underlying business reasons for and accounting implications of business transactions. Frequent access to a computer that connects to the Internet. •	A working e-mail account that you check regularly. •	The ability to view video files, either in a streaming (Flash) or downloadable (QuickTime, iTunes, iPod, iPhone) format. 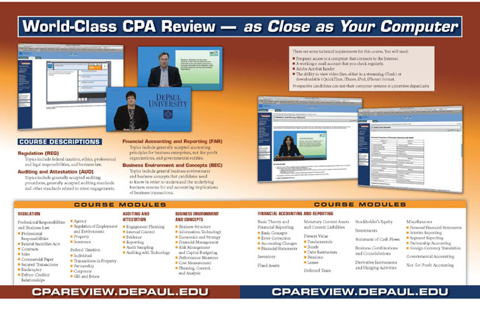 The CPA Review Program is designed and taught by professors from DePaul University’s College of Commerce; including the School of Accountancy and Management Information Systems, the Department of Finance, the Department of Economics, and the Department of Management. All faculty members come to the program with extensive teaching credentials and exemplary professional experience. The course is led by Kevin Stevens, Director of the School of Accountancy and Management Information Systems, under the guidance of O. Ray Whittington, author of Wiley CPA Exam Review and Dean of DePaul’s College of Commerce. Candidates may earn up to 8 semester hours by taking the full CPA Review program for credit. If you are taking the course for CPA exam credit, you connect online and work through the lecture content, complete the assignments and quizzes, as well as the final exam. Credit may only be earned for qualification toward the CPA exam and may not be applied toward any undergraduate or graduate degree program.